National Press Club in Washington D.C. 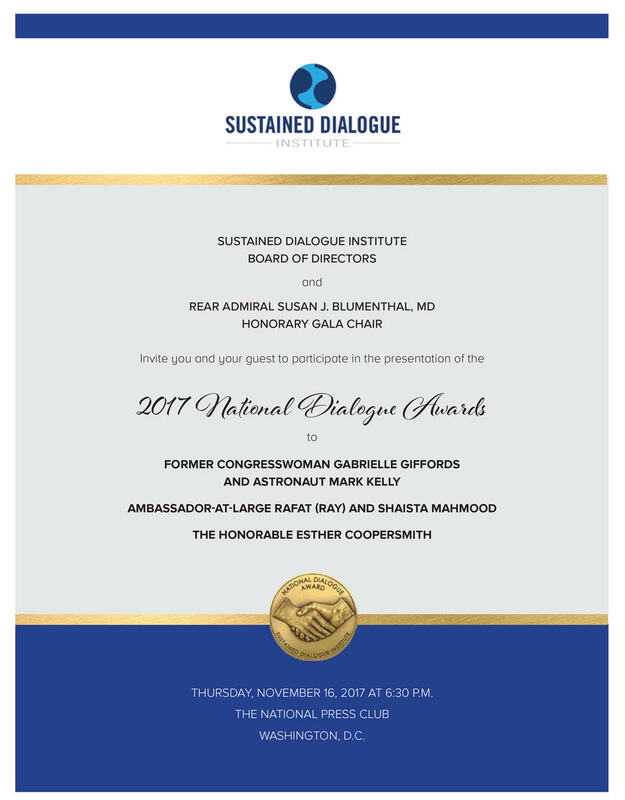 Please join leadership and friends of Sustained Dialogue Institute for the Fourth Annual National Dialogue Awards Gala, on Thursday, November 16 at 6:30pm at the National Press Club in Washington, DC. This gathering is SDI’s flagship annual event celebrating visionary leaders whose accomplishments advance our goal of creating a world where people co-exist peacefully, justly, and productively through dialogue across divides. This special evening could not come at a more critical time for America and for our world. We are pleased to announce the 2017 honorees, who, despite personal tragedy and unrelenting circumstances, have made monumental contributions to uniting through dialogue across divides. Former Congresswoman Gabby Giffords and her husband, astronaut Mark Kelly, will receive the 2017 National Dialogue Award, memorializing Hal Saunders, SDI’s beloved founder and architect of President Jimmy Carter’s Camp David Peace Accord between Israel and its neighbors. Ambassador-at-Large Rafat (Ray) and Shaista Mahmood will be the recipients of the 2017 National Dialogue Peacemaker Award, recognizing their tireless work building bridges and understanding between those of different religious, cultural, and economic backgrounds. Goodwill Ambassador for UNESCO, Mrs. Esther Coopersmith, will receive National Dialogue’s Lifetime Achievement Award for her manifold contributions here in our nation’s capital and throughout the world. 2017 National Dialogue Award honorees join an illustrious group of past recipients to include U.S. Associate Supreme Court Justice Ruth Bader Ginsburg in 2016, former Senate Majority Leader and Chief Negotiator for the Northern Ireland Peace Process George Mitchell in 2015, and Civil Rights leader and Congressman John Lewis in 2014. For more information about the event, including sponsorship and registration for ticket purchases, click the accompanying link. For more information about the event, including sponsorship and registration for ticket purchases, click the link here. You may also reach out directly to Katherine Griffin Hand via Katie[at]sustaineddialogue.org or 202.374.9088.